Evaluate the environmental impacts for each method. 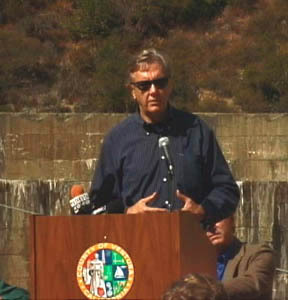 On October 12, 2000, the Secretary of the Interior Bruce Babbitt came to Matilija Dam for the Demolition Demonstration Project. 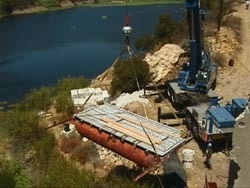 The demonstration consisted of the removal of a block of concrete, cut from the upper spillway of the dam. 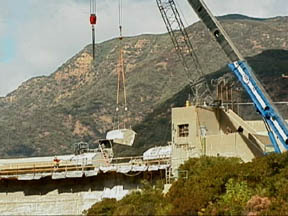 Large cranes lifted the block and placed it on the back side of the dam. The October 12 event at the dam site was planned and coordinated by a dedicated and enthusiastic group of Ventura County employees as well as representatives from the Matilija Coalition nongovernmental organization. 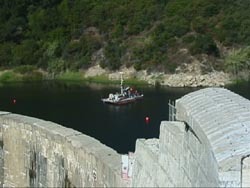 This event marks a major step toward the eventual removal of Matilija Dam. 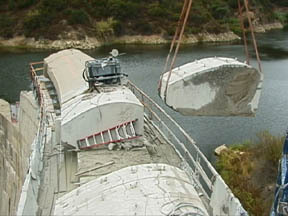 Matilija Dam holds back over 6 million cubic yards of silt, sand, gravel, cobble, and boulders. 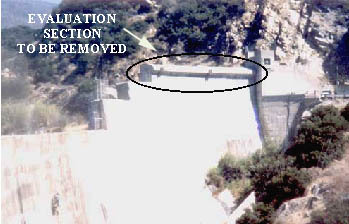 Handling this sediment is the primary technical issue with the removal of the obsolete concrete dam. 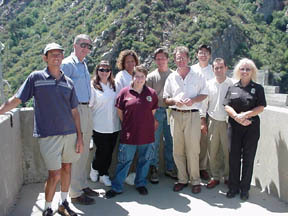 This summer, a Bureau of Reclamation geological team collected fifteen sediment core samples from behind the dam. 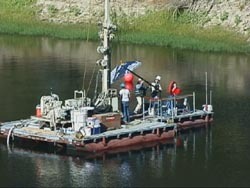 Eight samples were drilled from a floating barge in the reservoir area behind Matilija Dam, and seven were drilled on the dry delta upstream of the reservoir. Analysis of these core samples will determine the distribution of the sediments trapped behind the dam, one of the first steps in the Feasibility Study now underway. 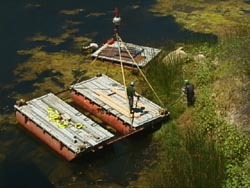 In order to drill within the lake, a barge was lifted onto the water in sections and assembled to provide a mobil floating drill platform.